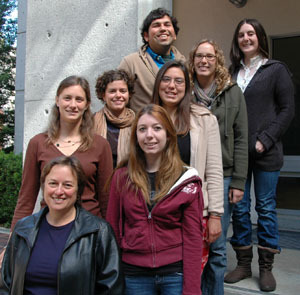 Sarah Rabkin, front, teaches a popular writing class called "Environmental Action Through Writing." This spring, students in Sarah Rabkin's Environmental Action Through Writing class tried their hand at producing works powerful enough to change hearts and minds. Inspired by the work of such legendary authors as Terry Tempest Williams, Edward Abbey, and Annie Dillard, students relied on the guidance of talented instructors, peer support, and practice, practice, practice to improve their own writing. "This quarter is when I realized, 'Hey, I'm actually a good writer,' " said Kate Pearl, a junior majoring in environmental studies and economics. Pearl enrolled in the upper-division environmental studies class after realizing that writing is an invaluable tool "to get your point across and convince people." But the class was a struggle for Pearl, who had avoided writing all through high school because it was difficult for her. "I always loved math and science," she said. "Every time I had to write a paper, I had a breakdown. Now it's become easier." Under the unfailingly supportive tutelage of Rabkin, whose teaching formula combines access, extensive feedback, and firm deadlines, Pearl and her 25 classmates overcame doubts and surprised themselves with what they produced. From short radio pieces to lengthy literary essays, course assignments challenged students on many levels. For many, the class was the first time they'd been asked to think deeply and write from their own perspective. "More than anything, this class has given me an opportunity to explore my own opinions," said Audrey Fry, who is majoring in ecology and evolutionary biology and environmental studies. "It's helping me figure out what I believe in. I've been doing some serious soul searching." The class gave Pearl an opportunity to grapple with her discontent with traditional economic theory, which she explored in a literary essay about her family history. For Fry, the class brought together two compelling interests: She decided during high school that she wanted to study biology but felt torn when a favorite English teacher encouraged her to write. "As a freshman, I saw this class, which looked like the perfect synthesis of both my interests. I've been looking forward to it for several years," she said. The rigorous class is structured to help students break bad habits, like dashing off superficial writing. Rabkin requires students to revise each draft multiple times, and each is returned covered with comments, questions, and requests--for more precise language, more compelling imagery, more heartfelt reflection. The result is a deeper level of engagement with the material than many have ever experienced. "Literary analysis is like walking with crutches, because you're walking along on the shoulders of what others have said," explained Heather Griffith, who is pursuing a combined major in environmental studies and biology with a minor in literature. "I'm used to the formula, and I can whip it out. In this class, you have to do more thinking." Daniel Press, professor of environmental studies and chair of the department, is a big fan of the class, which he co-taught with Rabkin for several years. "I learned an incredible amount," he recalled, adding that he would offer 10 sections of the class and require it of all majors, if there were funds to do so. "We have a very writing-intensive major anyway," he noted. UCSC faculty recently endorsed an enhancement of writing instruction on campus. A new graduation requirement will ensure that all students receive high-level instruction tailored to their field of study. Rabkin, who has taught writing at UCSC since 1985, believes writing is an essential life skill that prepares students "as citizens, members of a democracy, change agents, and human beings." "Learning to write is learning to think," she said, adding that her class builds on the foundation students get through lower-division classes offered by the Writing Program. "By the time students get to my class, though, they are by no means finished learning to understand and develop arguments, how to communicate a position, how to support a position, and how to articulate what they think about an issue. Writing develops intellectual fluency." Rabkin's students described her as "approachable," "down to earth," "encouraging," "helpful," and "easy to talk to." "She insists that you work at something until it's right. She demands that time and dedication," said one. For her part, Rabkin described teaching assistant Sarah Carvill (B.A. environmental studies, College Ten, 2007) as one of the best writing instructors she's ever encountered. Carvill earned her master's degree in environmental studies from the University of Montana this spring and will begin the UCSC doctoral program in environmental studies this fall. She was an affable role model for aspiring writers in the class, because she discovered her own passion for writing when she took the class as an undergraduate. The course's emphasis on environmental action through writing is particularly apt for students in environmental studies, many of whom struggle with feelings of hopelessness about the state of the planet. Writing can be a tool for social change, they learn, and Rabkin's assignments encourage students to engage in public debate. After writing 90-second opinion pieces for radio, many recorded their spots for broadcast on KUSP Radio's "First Person Singular" program. And Fry had an opinion piece published in her hometown paper. It takes work to formulate one's own opinions and courage to share them in a public forum, said Fry, who wrote against a proposal to build an asphalt plant near a unique wetland--and wasn't dissuaded by the attacks that inevitably followed the publication of her piece. "If you're willing to put yourself out there, people will listen to what you have to say," she said. "It's good to have that push, that encouragement. Now that I've done it, it's not so hard. I will continue to do it." Mike Vais, a junior majoring in environmental studies, scored a major success with a persuasive-writing assignment that morphed into a full-fledged campaign to encourage students to walk instead of ride campus shuttles or city buses. Vais had planned to make flyers to publicize his "Slugs with Feet" campaign but opted instead to create a Facebook group, which took off like the proverbial wildfire. "The amount of support is just amazing," said Vais. "I didn't see it coming." The response has been encouraging for Vais, who said he has felt a lot of internal conflict "because we're all complicit in this environmental crisis because of our way of life." Rabkin's class has been transformative, said Vais. "Writing has helped me connect my own thoughts to the rest of the world," he said. "I was feeling really bummed out, but working hard at a piece of writing alongside other motivated students was very empowering. My parents are thrilled to see me becoming a self-motivated, passionate individual. They've been waiting for me to spread my wings." Inspired by Thich Nhat Hanh, author of The World We Have, Vais sums up his experience in Rabkin's class by saying, "The thing about this class is it's not so much what's provided by the teacher as what you encounter on your own."